Here are some tips from KSA Grading on how to spot a fake Patrick Roy 1986-87 O-Pee-Chee #53 Rookie card. I had a card graded by Beckett, a Bobby Orr rookie card that they gave back to me as a possible fake. No other explaination, and no comments on why they thought that this card was a fake. I spent a lot of money to have several cards graded and this is what I paid for. NOTHING? If they are going to accuse you of having a fake card the least they could do is give you reasons as to why they consider this to be. I will never have Beckett grade another card of mine, this is the most unproffessional grading company I’ve been involved with. I have one that does not seem to have these attributes but it isn’t printed on the back. Now there arent any error roy rc cards that i heard of except this one. Think it’s a fake? For a few years Topps and OPC hockey and baseball card boxes had 4 cards at the bottom of the box usually ID’d as A, B, C, D… However the only card I remember from the TOP of the box that didn’t have a perforation through one of the corners was the 1986-87 hockey box. The blank back Roy RC card you have is a cut out of the top of the box which contained the 1986-87 packs. It is not a fake. It is more likely a “blank back” which is in fact a corrected error card. You could have hit the jackpot my friend. Have it graded by Beckett or a company of your choice. Can you send me a scan of the card? 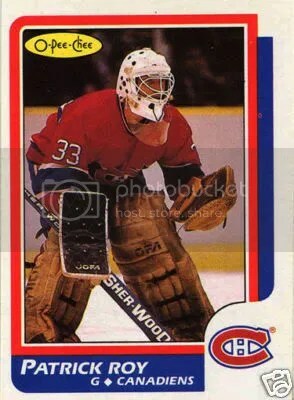 i have a o-pee-chee patrick roy 86-87 hockey card, i have seen pictures of others and the all have fancy borders and a motreal canadains symbol on the bottom. mine is just a picture patrick roy, whith his name on the bottom and o-pee-chee in the top right hand corner. on the back is something that i noticed is a hockey puck with the numer 36 in it, it also has two sets of four stars on the bottom of the back. is this just a different virsen or a fake? im really confuesd, if you have any info can you tell me? I have a Roy rookie but it is bare on the back, it’s just the front picture. Is it worth anything? I HAVE THIS REAL CARD its in NEW condition and i dont know what it is worth can someone help me out? Hello I was wondering have you ever heard of a Bobby Orr rookie card with no front picture? Its whitish brown and you can actually see the photo and borderline kinda engraved in the card but it is totally blank. Back is brown, has no circle near year. It was found in my granddads safe deposit box. Wondering what is it, and how much is it worth? Could it be a test or plate? Its in excellent condition. Please get back to me thanks. I sold the Orr 8 months ago for $35,000 to a private dealer, thanks.